You can download the full version of Rise of the Triad from the download store listed below. The HUNT Begins is a stand-alone prequel to the retail game, Dark War. 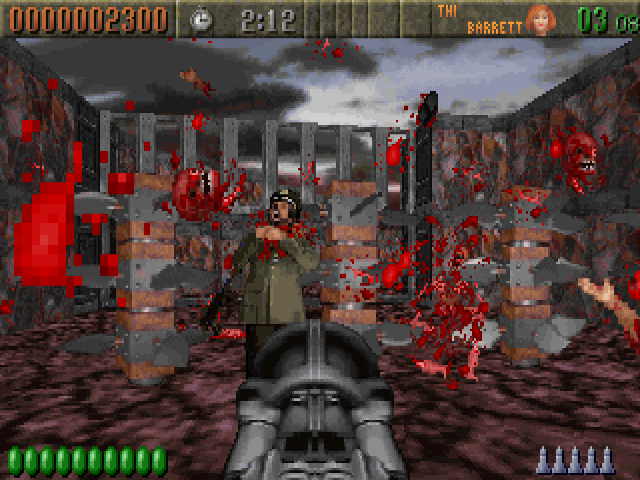 There are seven regular single-player levels, one secret level, and two single-player levels accessible only by the use of the level warp cheat. 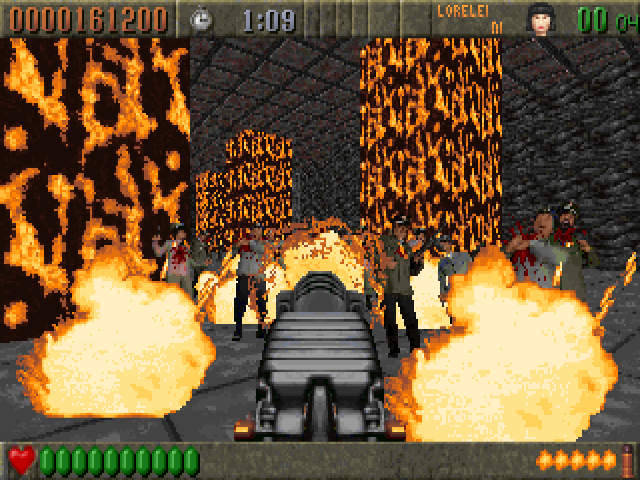 The LaserSoft expansion adds three more single-player and three multiplayer levels. 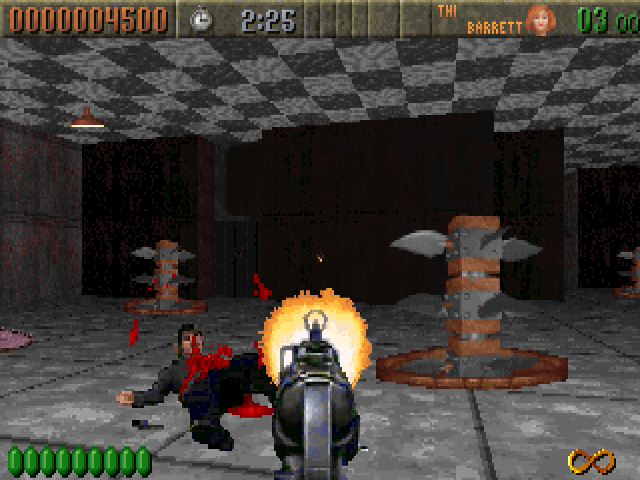 To add the extra LaserSoft levels, please check the instructions inside lasrrott.zip. Take on the role of Taradino Cassatt, operative of the High-risk United Nations Taskforce (HUNT). Your mission is to investigate suspected cult activity on a small island in the Gulf of Santa Catalina. You are authorized to use whatever force necessary to complete this objective. 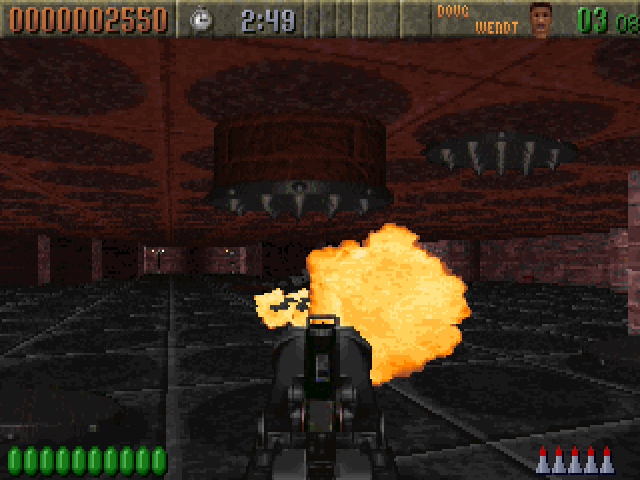 Rise of the Triad uses a modified Wolfenstein 3D engine with many added features, such as dynamic lighting, room-over-room architecture and destructible environment. 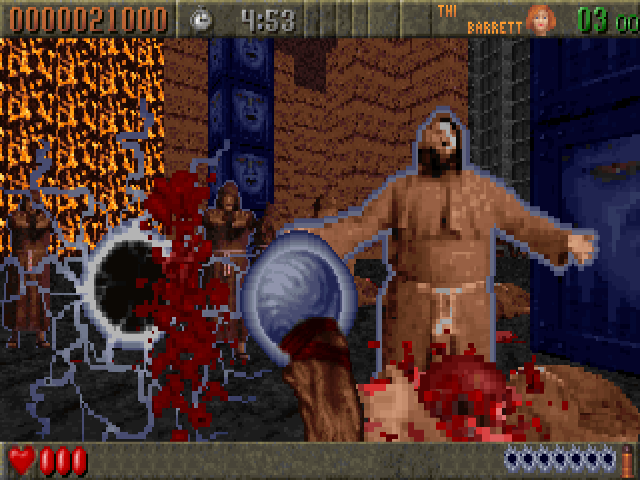 There is a great variety of weapons, items and enemies. 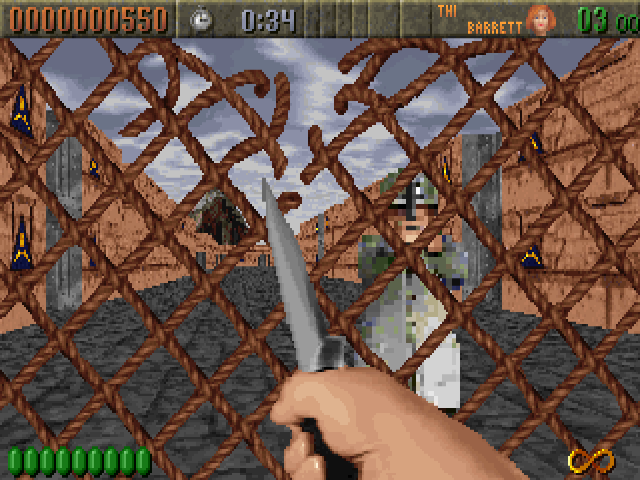 The game doesn't take itself all to seriously, focussing on fun, action-packed gameplay. One notable feature of the game is a large number of different bonuses the player can earn. To get a specific bonus you might need to use (or not use) a certain weapon, pick up all items of some type in a level, or destroy all items of a certain type etc. A special BONUS BONUS is granted when all possible bonuses have been collected in a level. Type in each cheat code, letter by letter, to get the desired effect. You can type in either the "code" or the "alternate". Note that for the codes, the slash is a backslash, not a forward slash. The codes are not case sensitive. The "dipstick" code must be given before any others, to enable the other cheats. \ECC  DIPSTICK    Enable/disable cheat codes. \GOO  GOOBERS     Restart from first level. \L8R  GOGATES     Exit to DOS. \ECL  GOARCH      Exit current level. \EKG  [none]      Extreme Gib mode. \LEE  MAESTRO     Game jukebox. Choose a song! and you will never run out of ammo. \DON  DIMON       Light diminishing on. \DOF  DIMOFF      Light diminishing off. \SON  SHINEON     Light sourcing on. \SOF  SHINEOFF    Light sourcing off. \CON  GOTA386     Turn off floor and ceiling textures. \COF  GOTA486     Turn on floor and ceiling textures. \GAI  SIXTOYS     Get keys, bulletproof armor, health. \BUM  SLACKER     Get all keys. \GW3  PLUGEM      MP40 machine gun. \GW9  SEEYA       Hand of god (permanent god mode). \CAM  RIDE        Missile camera on/off. \HUD  WHERE       HUD on/off (x,y,room coordinates). RECORD            Record a demo (does not work in v1.0). STOP              Stop a demo (does not work in v1.0). PLAY              Play a demo (does not work in v1.0).